This is the first in a three-part series about Cognitive-Behavioural Therapy (CBT), designed to help you have a better understanding of what it involves. In the next post, we’ll be taking a closer look at what exactly it can help with, and in the final article, we’ll discuss what you can do between sessions to maintain wellness. This article will give you a better idea of what CBT is, who it’s for, how it works, an overview of the problems it helps with, and what you can expect from a session with us. It’s important for you to feel comfortable and confident about the CBT practitioner you choose, whether for yourself or a family member. At Newcastle Psychologist & Counselling, we work hard to provide the ideal support solution for each client. In order to help you properly, we offer meetings in-person in one of our clinics in Jesmond or online if you can’t come in (or live elsewhere). We also offer evening and weekend sessions too, so we fit in with your busy lifestyle, you can book online. Cognitive-Behavioural Therapy is most often used to treat a variety of problems, including depression, anxiety, trauma, OCD and worry, but it can be used to help those with a range of physical and psychological difficulties. 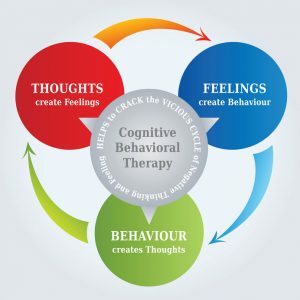 CBT is based on the concept that your thoughts, feelings, physical sensations and actions (“behaviours”) are interconnected, and those negative thoughts, feelings and behaviours can trap you in a vicious cycle or spiral. When you start CBT, you’ll be working in a safe way to identify negative patterns and thoughts, then given the tools to change these unhelpful thoughts and behaviours and to deal with problems by breaking them down. We’re committed to supporting each client through to the right outcome. In your first session, your therapist will ask about what you’re currently going through and maybe some questions about your past or future worries. Even though it might be hard, it is helpful to be as open and honest as you can about your problems. Who is Cognitive-Behavioural Therapy For? CBT has been proven to be effective for a range of problems (including depression, anxiety, trauma, addiction, generalised anxiety disorder, worry and panic) in people of all ages, though it might be presented in certain forms depending on the client. It’s also suitable for couples and families. As well as regular CBT, Dr Stuart Sadler (Chartered Psychologist at Newcastle Psychologist & Counselling) is also trained and experienced in a specialist form of CBT aimed to help improve people suffering from insomnia, nightmares, or early morning waking (Cognitive-Behavioural Therapy for Insomnia, CBT-I). This uses different methods and techniques from regular CBT and has been shown to have outstanding results even in people that have suffered from sleep problems for years. How does Cognitive-Behavioural Therapy Work? Cognitive Behavioural Therapy is designed to primarily help you break the cycle of negativity. Patterns can be established from a young age and depending on how you respond to things, you may find you develop an automatic, self-critical inner voice which can have a serious impact on your wellbeing. If you experience situations negatively, this can lead to negative emotions and impact on your behaviour. You then fall into a cycle of constant criticism and feelings of inadequacy. CBT will help you break that cycle. At Newcastle Psychologist & Counselling, we support you to resolve issues that are holding you back. CBT is very much a collaborative process, and your psychologist is dedicated to enabling you to make decisions yourself, rather than making them for you. Our team often have a short conversation with clients before they come for their first session, so you’ll understand the benefits of CBT and to ensure that they are the best therapist to help. If there’s anything you’re not sure of, or if you’d like more details on anything discussed in this article, one of us will be pleased to answer your questions. CBT focuses primarily on the here and now though may also look at what’s happened in your past and how this may be impacting your current situation. It focuses on helping you to find everyday, practical solutions to feel more positive and able to deal with challenges. The National Institute for Health and Clinical Excellence (NICE), the independent body who review the evidence and provide guidelines for physical and psychological treatments have found that CBT is an effective way to treat mental and physical health issues (including pain). CBT is delivered by fully-qualified psychologists, so you can be assured that you’ll be properly supported. It can also help those with chronic illnesses to manage their mindset and feelings about their health. It doesn’t treat the physical symptoms but enables you to manage them better and help you focus on living the best life you can. It’s worth noting that CBT can be used along with medication prescribed by a doctor, or on its own. A CBT session lasts approximately 50 minutes, and it involves working with a therapist either weekly or fortnightly. Your therapist will tailor your course to help you reach your personal goals and plan the sessions with you. During the session, your therapist will help you to work through your thoughts and behaviours and support you to find ways to change these, so you get the best results possible from CBT. You may also be given ‘homework’ which takes the content of the session out into the real world so that you can start to make changes in your everyday life. When you next meet with your therapist, you’ll be able to update them on your progress or any struggles you had, and then you can work together to refine the strategies until they suit you best. Cognitive behavioural therapy gives you the tools you need to introduce new ways of approaching the challenges we all face in life and encourages you to think positively. Copyright © 2018 Newcastle Psychologist. All rights reserved.